In the latter part of his career, William Kurelek undertook to chronicle the different ethnic groups within Canada in several series of works. One of these focused on the Inuit, referred to as Eskimos at the time. In this fascinating scene, we see a single fisherman standing alone at a hole cut through the ice. 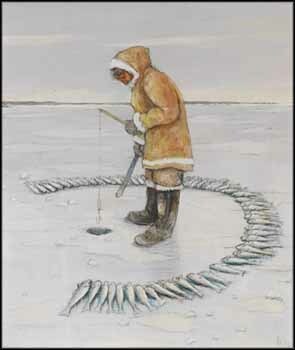 Kurelek wrote, "After the cod has its flesh eaten, its soul will return to the lake, and enter the body of another fish, prepared to be caught again. The fisherman also believes that if he lays the fish in a circle around him, heads toward the hole, then he will always be in the midst of a school of fish." The image is serene, the feeling it evokes almost spiritual, and the composition and treatment of the figure recall the religious themes often found in Kurelek’s work. The overall white and grey palette is accented beautifully by the colour of the fisherman's parka and conveys a feeling of reverence, uplifting the fisherman from his state of cold loneliness to a state of dignified serenity.